Venezuelan President Nicolas Maduro, poses with FAO director Jose Graziano da Silva. On Sunday, The FAO, aawarded Venezuela a special certificate for reducing hunger by half, despite current food shortages in the South American nation. Despite going through food shortages that are so severe that people line up for hours outside supermarkets for basic staples like corn flour and chicken, Venezuela is making big strides in reducing hunger. Or so the UN says. On Sunday the FAO, the UN organization that specializes in nutrition, included Venezuela in a group of 18 nations that that have cut their number of hungry people by half over the past 20 years. 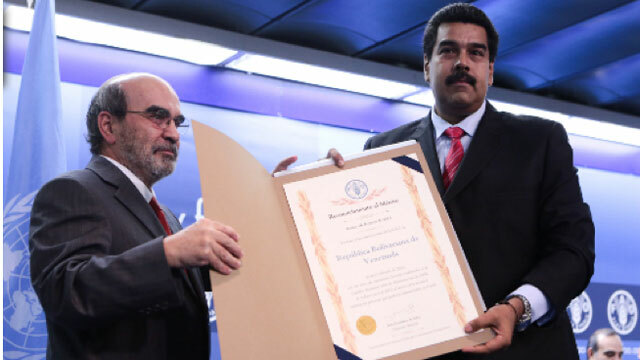 The achievement, which was announced in a ceremony attended by several heads of state, won the Venezuelan government a certificate and a photo between President Nicolas Maduro and the FAO's director, Jose Graziano da Silva. Maduro, who is facing accusations that he stole Venezuela's election, has embarked on a diplomatic offensive to seek support abroad. At the FAO event, staged just a day before Maduro met with Pope Francis, the Venezuelan president said that he was "proud" of the UN certificate and thanked the deceased Hugo Chavez for reducing hunger in his country. But the prize angered Venezuelans who have been struggling with food shortages for the past few months. "This is a joke, there is a big food crisis in Venezuela right now." tweeted @titamarval in response to a question posted by the CNN show CafeCNN. The program asked viewers what they thought of the FAO certificate awarded to Venezuela. "They bought this with [money from oil] barrels it's part of an image campaign" claimed twitter user Guillermo Suarez. In a statement published last week, explaining the reasons for which Venezuela would be recognized for fighting against hunger, FAO said that Venezuela reduced the number of people suffering from malnutrition from 13.5 percent of the population in the years 1990-1992, to less than 5 percent of the population in 2010-2012, thus complying with one of the UN's millennium development goals. In the statement, which mostly mentioned data supplied by the Venezuelan government, FAO said that government-run supermarket networks and nutrition programs created by Hugo Chavez had helped to bring about this reduction in hunger. One of these market networks called Mercal sells goods for prices that can be up to 70 percent cheaper than the regular market price. Venezuelan government statistics also show that overall the country consumed 26.8 million tons of food in 2012, which is almost twice as much as the 13.8 million tons consumed in 1999, the first year of the Chavez administration. But Venezuela's opposition takes some issue with these stats and mentions that strict price controls and expropriations of local businesses have greatly reduced local food production, as there is little incentive for local companies to make the stuff. According to Julio Borges, an opposition leader, Venezuela imports 70 percent of its food from the U.S., Brazil and regional allies like Nicaragua. The government claims that only 30 percent of Venezuela's food is imported. It adds that, despite the long lines at supermarkets, Venezuelans consume an average of 3,182 calories per day. According to the UN people who consume less than 1,800 calories per day suffer from malnutrition. As the debate over Venezuela's hunger problems rages on however, one thing is clear: Finding basic foods like corn flour, milk and chicken continues to be tough in Venezuela. Just recently a regional government suggested implementing an electronic system, which would prevent people from buying too much of the same item, in order to stop consumers from stocking up or re-selling what they buy. The strategy was discarded by officials after public outcry, and fears of Cuban-style food rationing arose. What has prospered however is a cell phone app that tells you where to find products that are going scarce. The app called Abasteceme, or "Supply me," has been downloaded thousands of times since it was launched in the last week of May. FAO's statement on hunger reduction in Venezuela, made no mention of this app or of the long lines in the country's supermarkets.